Hello world! Have some brownies! Welcome to my blog. I hope I do well in keeping it updated. 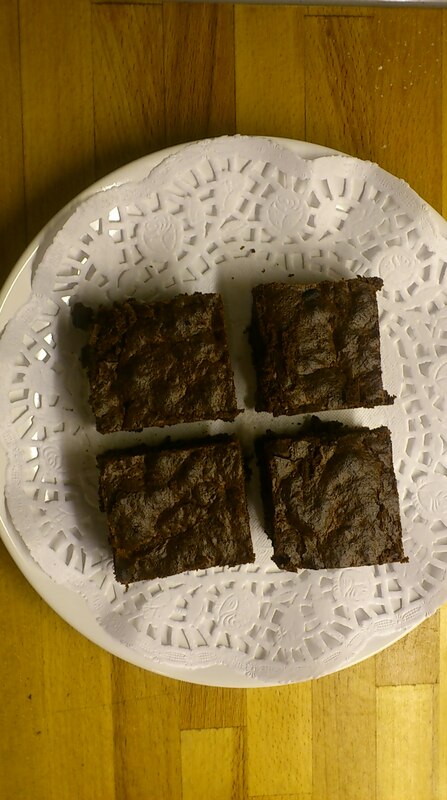 It is a tradition in my family to bring cake for every occasion, so for the opening of my blog, I brought you some Brownies. It’s been a confusing day. When I work I like listening to Israeli radio online, especially on Friday mornings. It’s a music station but today the music was interrupted by notifications of rockets falling on towns in Israel. Scary! The I went to the kitchen for lunch and turned on BBC Radio 2, who are all cheerful about their ‘Children in Need’ campaign. So I’m emotionally confused and in these situations baking is a good comfort. I decided to experiment with Brownies and felt it will be a nice thing to share as my first blog post. I’m trying to convert favourite recipes to be gluten free, and on our latest visit to Israel we went to an Ethiopian grocery shop and bought some Teff flour. It’s gluten free (which is the way we are eating now) and supposedly very nutritious. Brownies aren’t that nutritious but don’t require a large amount of flour. I looked at Nigella’s recipe for flour-less brownies but I didn’t have the required ground almonds, so I settled for the easiest brownie recipe I know from Jamie Oliver’s 30 Minute Meals book and made some adjustments, replacing the 4 heaped tablespoons of self-raising flour with teff flour and 1 tsp of baking powder and omitting one of the eggs. You know what, it worked! 5. This is a great tip from Jamie Oliver: scrunch up a large enough piece of greaseproof paper under a tap. Flatten it, lay it in a baking tray (approx 32x26cm) and drizzle with olive oil, or use the butter wrapping paper to grease and rub it in. 6. Using a spatula, spread the brownie mixture evenly onto the tray, about 2.5cm thick. 7. At this point you can sprinkle toppings over, such as pecan nuts & dried cherries or hazelnuts & raisins or even dunk white chocolate chunks for a nice contrast. I kept it simple this time. 8. Bake in the centre of the oven for 25min. The brownies should be gooey but hold their shape.